Fifth grade language arts and science classes at Spirit Lake Middle School were especially interesting last Friday. In language arts, I got to watch the results of the Snack Attack assignment. The students had been asked to develop a presentation that detailed the process of making their favorite snacks. It was an introductory assignment designed to give them experience for a future and more comprehensive presentation. On Friday, several students did Keynote (PowerPoint) presentations, and one played a video that showed her actually making the snack while she explained the process. The presentations were creative, entertaining, and informative. I had heard that I should prepare myself to be amazed in science, and I found that to be true. The students conducted an investigation/demonstration which resulted in a fabulous, foamy substance called elephant toothpaste. With goggles on, one student held up the flask he was carrying to his table and exclaimed, "I feel like a real scientist!" Learning has never been more fun! The students were totally engaged, and many recorded their scientific discoveries with their webcams so family and friends could see the young scientists at work. 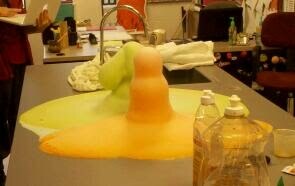 If you are in need of elephant toothpaste, the recipe is included in this YouTube video.